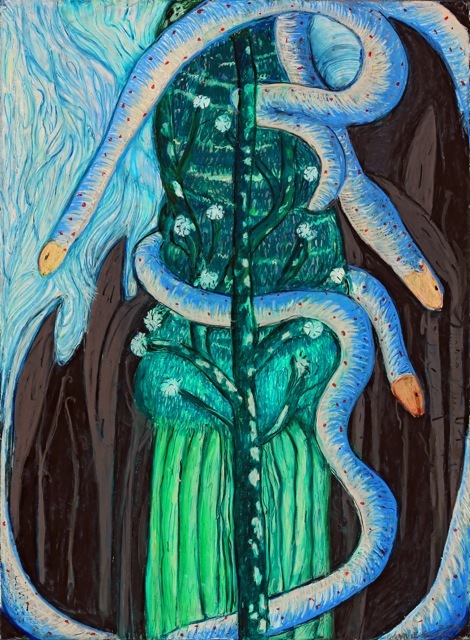 Bonnie Phelps Sucec is the creator of spiritual and imagist works and also an art educator. She lives in Salt Lake City, Utah. Sucec first studied with Don Olsen at Jordan High School. She then studied at Brigham Young University from 1960 to 1962, at California College of Arts and Crafts from 1962 to 1963 and last but not least at the University of Virginia Commonwealth University for two years. Sucec earned an MFA in painting drawing from the University of Utah in 1984. Her work is nonrepresentational and her preferred medium is gouache. The War and the World, Life Line, and Fluid Vision are examples of her work. Her work is included in the collection of the Salt Lake Art Center, the Utah Arts Council, and the Utah Museum of Fine Arts. The Phillips Gallery represents her work. Susan Johnson Beck is a mixed-media artist, painter, and educator. She studied at the University of Utah where she earned her B.A. in 1965, and her M.F.A. in 1968. She also studied at the California College of Arts and Crafts. Teaching experiences include the University of Utah 1969-present, Utah State 2001-present, S.L.A.C. 1969-70, 23 years at Rowland Hall, Artist in Education Program of Lollapalooza (a children's art program), Salt Lake City Arts Council, and some private instruction. Beck is an excellent teacher with extensive training in traditional painting technique. Described as a portrait specialist in the mid-1970's, she was painting a series of detailed still-life objects by the end of the decade. Yet her ideas have drawn her increasingly toward the use of mixed media and a wider range of expressive forms in more recent years. Her work has been shown at the Phillips Gallery, Salt Lake Arts Center Faculty Exhibition, Utah Biennials, Utah Arts Council shows, The Springville Museum of Art, Weber State College, and at S.L.A.C. with Bonnie Susec and Meredith Moench Summer 1997. I have worked with both Bonnie and Susan over the years and consider them to be two of my dearest friends. Both of them have strong artistic convictions and unique creative sensibilities. They are fearless and soulful in their work and have boundless curiosity, energy and intuition . They are also just incredibly lovely and generous human beings and actually created my wedding cake back in 2013 - the most extraordinary wedding cake anybody could have asked for. Bonnie and Susan have been friends for many years and developed a unique show together at Finch Lane Gallery back in 2014 titled "Short Stories", which was later expanded to a larger exhibition at Kimball Art Center in Park City in 2015 titled "Out Of Sight/In The Mind". These exhibitions were the inspiration for this interview. Susan: I have loved drawing as long as I can remember loving anything. It was something I have been able to do well and has driven my interest in exploring art techniques and concepts. It is helpful when teachers and acquaintances praise ones work because it can support an interest and move it forward into a commitment. I attended the University of Utah for both my Bachelor and Master degrees. I was also able to spend a year between degrees studying art at the California College of Art and Design. This experience was very important in expanding my view beyond Utah. I had a very ordinary childhood with one exception. My brother died in an accident when I was 17. It was a very important event in my life and has affected every choice I have made. Bonnie: I always thought I was an artist, of sorts, because I made stuff out of boxes, ribbons, junk, and magazines. It wasn't until I went to High School and my teacher was Don Olsen, he was a well-known abstract painter, that I thought that maybe it was possible to to just be a painter. Can you talk a little bit about your creative process? Do you start with an idea, an emotion, energy, an image? Do you have specific rituals when you paint? Susan: I usually start with an image developed in drawing notebooks; usually they are figurative but not always. From there, it is a process of adding on until the surface is fairly complex and can then be developed by refining with color, value, texture and additional contextual elements. The emotional quality involves conscious decisions that usually relate to observations in nature, and how imagery makes me feel when I experience various qualities. The original drawing dictates the direction of the piece throughout the process, which can be chaotic at times. I like this part the most. Bonnie: My teacher was an abstract painter, so that is how I learned to paint. This was in the late 50's. I start with moving the paint and then I concentrate on color, shape, patterns, movement. I became familiar with the abstract artists work, there was an expression of energy and movement. I painted on everything and work on a large scale. 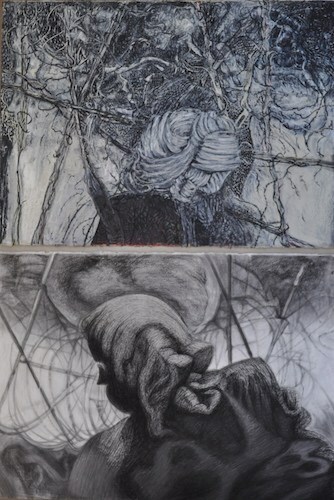 Title: “During The Week She Doesn’t Eat Much / She Only Eats Like This On Sunday” Susan Beck (top), Bonnie Sucec (Bottom). Bonnie: I admire the work of lots of artists of all kinds...but I would say Don Olsen, Shari Urquart, and of course Susan. Susan: I love children’s artwork for the spontaneity found there as well as the uninhibited spirit of their work; ditto for outsider art and primitive art. Also other artists who are close friends because I see their process and the development of their work on an ongoing basis. I also love other forms of art including dance and music. There is a kinship of spirit and intent that I feel close to. You have been friends for many years, how did you meet? Do you feel that you have inspired each other's work through the years and if so how? Susan: I met Bonnie because of her work. She was selling the most delightful painted dough figures at the Utah Arts Festival in 1977. I was working at the Art Festival through a CITA program called Artist’s In The City. I bought several of the figures, which I still have, and arranged to meet her at her home to get several more after the festival was over. Once I was in her home, I recognized a sister of the head, and when I left for home, it was with several additional pieces of artwork, a guinea pig named Faye, and a lasting friendship. We have done many big and small activities together: Lallapalooza, a children’s art agency that developed experiential, discovery art projects, teaching through the Utah Arts Council, visiting galleries and exhibits, and most importantly, we have always drawn together. There are so many aspects of Bonnie’s work that hold my attention: her freedom of expression, her daring use of color, her obsession with textures, her unusual compositions, but mostly her sense of humor. Bonnie: Susan makes me disciplined. I would have never done the kind of work we did together if it wasn't for her persistence. Susan and her work challenge me. I am grateful for that. Talk a little bit about the project that you were both involved with and that evolved over a seven-year period. Why was it an important project for you to do together and what discoveries did you make about each other as artists and friends in the process? And what did you discover about yourself? Susan: This project developed rather naturally through our drawing together. I think artists are always looking for some device to jar them out of their myopic view of their work. Bonnie and I have a very similar aesthetic appreciation, and I think I can say, we truly like each other’s work. We were both at a point of wanting a challenge in our work, and this seemed to be an interesting, workable idea. Drawing from verbal description has many layers. First, your own habits and preferences, then your strangely biased idea of the other person’s work, then the challenge of setting those aside to find a fresh yet personal approach to the elements of art used to create any piece of artwork. You are trying to stay true to yourself but respectful of the other person’s description. Since I use a lot of black and white in my work, I often found I would over exaggerate Bonnie’s description of color. If she said pink in a described area, I saw magenta when it actually could turn out to be pale peach. Describing a piece of artwork is difficult and is as much about mood and meaning as it is about technical aspects. In fact probably even more so. There is also an interesting thing with composition. I was often surprised at how similar that component could be in our interpretations. It made me think there are some overriding compositional elements that drive our choices. My most important discovery was to find how much I could trust both Bonnie and myself through this work. She never disappoints. Bonnie: Our work is very different: images, style, color, patternmaking, and message are sometimes quite opposite. It was at times hard for me to work from Susan's verbal explanation of her painting. Sometimes I thought I just couldn't do it. Mainly because of course I wanted my paintings to be good, as she did as well. It was a challenge. I love the introduction to this show, where you stress " strong partnerships initiate and excite experimental approaches to materials, imagery, and compositional devices as part of a larger practice. The goal was not to duplicate but to achieve a greater personal vocabulary within a very complex visual arena." Susan - can you talk about what insights you had from a form (craft's) perspective about your own work and Bonnie’s? Susan: Because my training was heavily based in using materials to recreate the “real” world, I rely on that skill for success. That pretty much had to go out the window in this project. So my work is light and shade defining objects, fairly colorless, a lot of depth of field, horizon line, that kind of stuff. 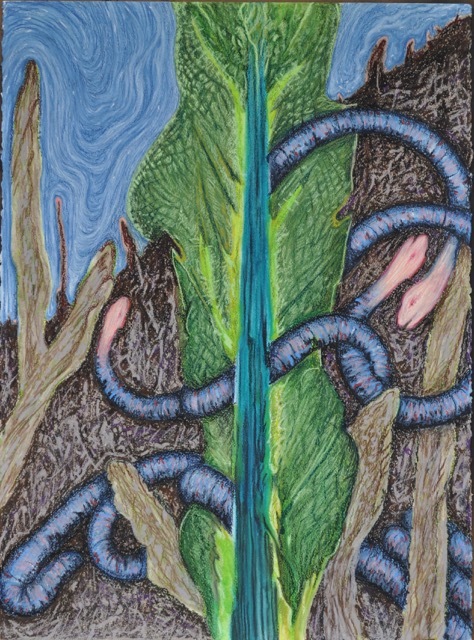 Bonnie’s work is colorful, textural, relatively flat, no attention to a horizon line or associated size relationships. Her work is full of humor for all to see, I think my work is funny, but most people see it as deadly depressing and morbid. The cross over into more of her world was so good for sense of humor. She really got me into the beauty of oil pastels, which I hadn’t really used much before we did this project. It turned out they are so flexible for layering, changing existing images, and creating unusual colors and textures to achieve complex, interesting surfaces. You are both such established Utah artists. What characterizes art in this State - is there a unique Utah art movement and if so, what and who epitomizes that for you and why? And why is work that is developed here important to have included in the National and International discourse about art? Bonnie: There is a strong tradition for landscape and figure art in Utah. It makes sense. I also think by not being influenced by popular trends, there is a creative energy here. Susan: It is difficult to be an artist in this state. The culture here does not include a lot of visual art, and there seems to be no involved audience for more challenging work. Even artists who are more within the range of what one would think of as acceptable find a very small market for their work. Still, there are a surprising number of very interesting artists working here. Fortunately, there are several non-profit venues that show more experimental work, thus the importance of funding for arts organizations. Art is a reflection of culture and Utah needs to be included this cultural documentation in all its forms. 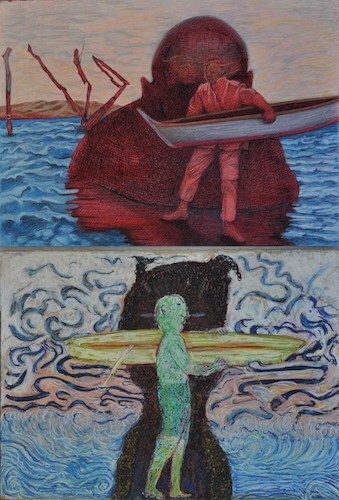 Title: “Here’s The Thing / You Might Not Be Seeing The Big Picture” by Susan Beck. Title: “Here’s The Thing / You Might Not Be Seeing The Big Picture” by Bonnie Sucec. Title: “Waiting For Fate / Like A Bus” by Susan Beck. Title: “Waiting For Fate / Like A Bus” by Bonnie Sucec. Title: “In The Woods / But Not Alone" by Bonnie Sucec. Title: “In The Woods / But Not Alone" by Susan Beck. Title: “You Might As Well Live / In The Wrong Direction" by Susan Beck. Title: “You Might As Well Live / In The Wrong Direction" by Bonnie Sucec. Both of you are great teachers of art, has teaching in any way helped you define your own creative voice? And what makes a good teacher of art? Bonnie: What makes a good teacher of art is listening and being aware. Also compassion - that goes for everything in life. Susan: Teaching has been a microscope through which I try to look at all the many aspects that make up art. The challenge in teaching is to articulate what makes artwork in all it’s many facets and helpfully impart that information for the student to use, as they will. It is always exciting to see what students come up with to solve problems. That is what one spends most of the time doing - looking for solutions to problems. Very much like putting a puzzle together. A good teacher loves and understands the subject and appreciates the many facets of each student, then looks forward to what happens when these two come together. Bonnie: I see inspiration everywhere. I love to look at art. I'm inspired creatively. Susan: Everything is capable of inspiring but I especially love music, dance, nature in all forms, surprise encounters with the visual world, weird books with or without pictures, other artists work, the newspaper. Bonnie: A unique idea. An unexpected surprise. Passion. A dedication to discovery, hard work and gentle acts. Susan: Very hard, if not impossible, for me to answer. So much of what we see is a product of time and in each time period there are innovators and refiners, experimenters and technicians, realists and explorers of imagination. Who can say? We have probably forgotten more important players than we remember or never knew about - so many more. I am reading a book titled “Ship of Theseus” which refers to a long forgotten war and the ship with which the conqueror waged his battles. The ship was honored by vowing to preserve it for all time. As time passed the ship began to disintegrate, and it was necessary to replace rotting boards. Well once you replace parts of it, is it the same ship or is it something else? The more boards you replace does it become less what it was and more something else? I see this question like a long history of ships - building, repairing, and replacing, all-important and necessary and part of an evolution. Susan: “I am more like myself than I used to be” from an old friend of mine. Susan: I would like to have been a musician, but that is out of the question because preforming in public paralyzes me. But I think, I could have been a good gardener or a park ranger. Bonnie: Good question. I don't know. Bonnie: I probably won't be around. I am happy to have the time to do my work. Susan: Out of the picture. Wedding cake created by Susan and Bonnie back in 2013.